Even as crews got back to work in Waterbury during the latest winter storm, anger continued to bubble for some residents over how the city handled the cleanup from the Blizzard of 2013. Waterbury was one of the last to finish digging out after the storm. Waterbury resident Domenic Davino took video of a Waterbury sewer department vehicle stuck in the snow after plowing out part of a private apartment driveway. 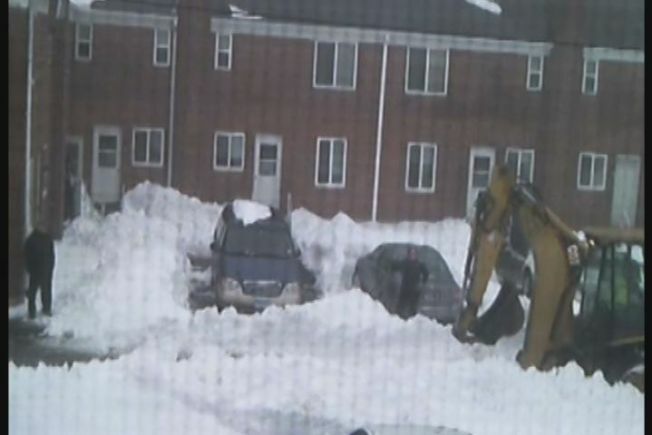 A City backhoe arrives to pull the truck out, and then comes back to finish digging out what Davino claimed is just one car. At first Davino was relieved to see the city crews. He said it was the first sign of help three days after the storm. But he quickly realized they weren't there for him, or for the rest of his complex. "They only plowed her car [out], pushed all the snow into the back of the other cars,” he said, referring to a neighbor, “When the truck got stuck we knew it wasn’t for us because it was private property. The city doesn't use their vehicles for private property." It would be three more days until Davino and his neighbors would see another city crew, this time to plow out the road the complex is on. After watching the video we went to Waterbury Mayor Neil O'Leary for answers. He told us there's more than meets the eye here. "I was very proud of the fact they were looking out for residents quite frankly and there certainly was no inappropriate conduct or behavior on any city workers' part,” said the Mayor. O’Leary said the city launched an investigation once officials saw the video. He said the crews were on their way to clear a path to a pump station at the end of the road, a maintenance priority in the days after the storm, and merely stopped and turned into the private lot to help someone who flagged them down. "This administration has been very diligent with making sure our employees are doing their job. And doing the right thing all the time,” said the Mayor. In the city's report investigators wrote that it did not appear that either city worker "did anything inappropriate." The report goes on to say the city “…discussed the need...to remind WPC employees to use caution when it may involve performing work on private property." Still Davino says he disagrees with the workers' actions.